Don’t you simply love pears? I do. They are one of my favorite fruits, especially when they are in season. My mom has a serious pear-producing tree at her house, and I asked her for a few pears. She hooked me up! First thing I wanted to make? Pear preserves. Sweet and juicy pears flavored with citrus and fresh ginger. Time to make some biscuits! Citrus + Ginger Pear Preserves. My, oh my. As much as I love apples, I’ve got to say that pears are even better. There is specialness in the crisp bite of a juicy pear. Especially these pears, home grown at my mother’s little fruit orchard. These pears come from trees planted by my late step father. We recently lost this amazing man to a very short battle with cancer, and we miss him so much. I think of him daily, and how his gentle sweetness always brightened everyone’s day. My daughters called him “Poppy”, and I like to think of this recipe as Poppy’s Pear Preserves. Maybe he would have loved this recipe. I like to think he would have. My mom can’t remember the variety of pear tree, but they look like Seckel pears to me. They are very crisp, to the point they are almost crunchy when first picked. They are short and round, and the skin has a beautiful mottled texture of green-yellow-brown that makes them stand out from a normal pear. 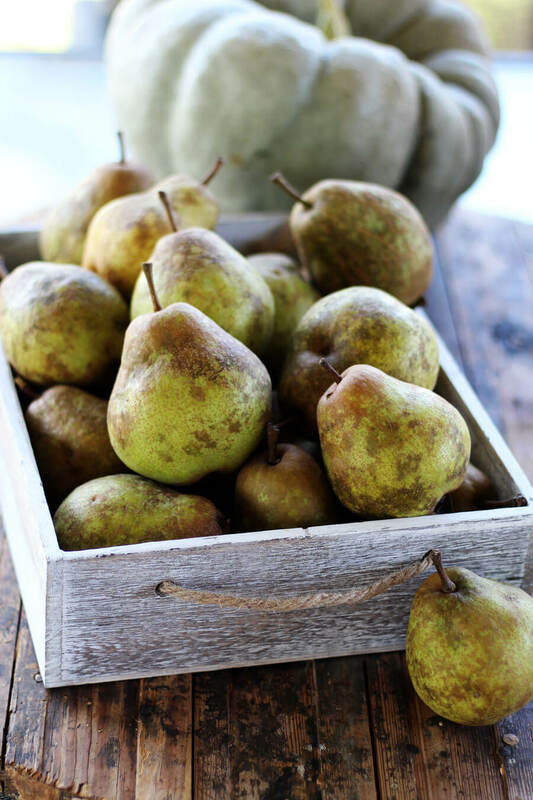 If you are a pear expert and know for sure what type of pears these are, please comment below the recipe. I’d love to know more about the pear trees that Poppy planted. Before we jump right in to the fruit and sugar, let’s talk about basic water bath canning for preserves. It is absolutely, 100% vital that you start with clean and sanitized jars, lids, utensils and counter tops. This ensures that your food will be safe and will not spoil. This part may intimidate you, but really, it is super easy. You can either sterilize your jars by washing them in hot water and then running them through the sanitize setting on your dishwasher. Or, my preferred method: simmering pre-washed jars in your water bath canner while you are preparing the preserves. Just place the jars in the wire canner rack and gently lower them into simmering water (not boiling). This keeps the jars hot and clean until you are ready to start canning. 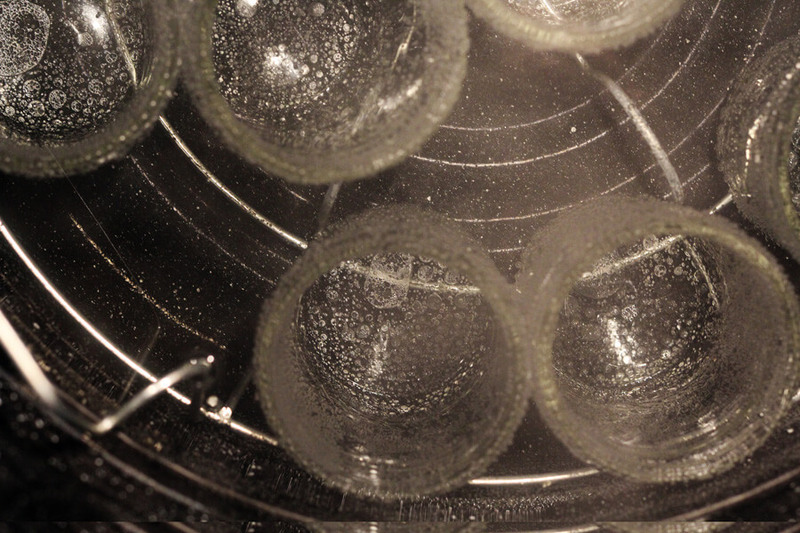 Wash the lids and rings in hot, sudsy water, rinse, and air dry. I like to get my cooking pot ready and take care of the citrus juice and zest first, adding it to the pot. Why? If I did the pears first, they would oxidize and start browning before I even get started. Preparing the juices first helps keep the fresh, translucent color of the pears. 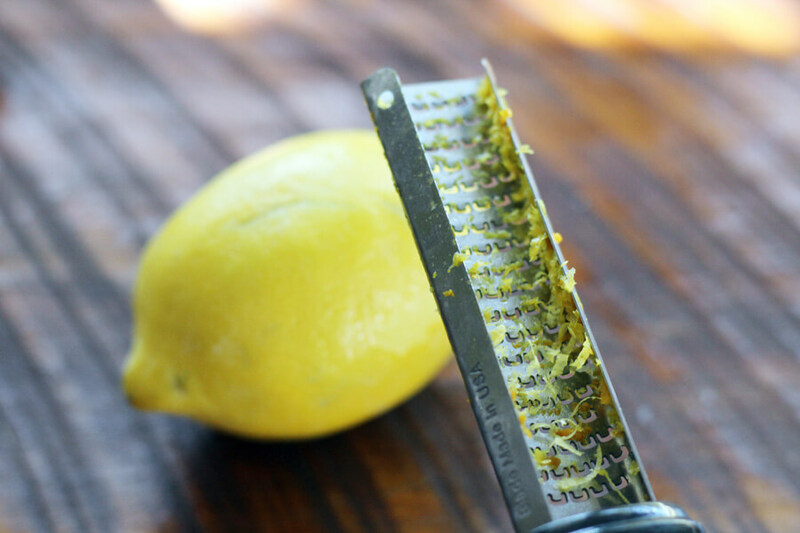 TIP: When you are grating your citrus fruit, turn the fruit frequently. You don’t want to grate too much in the same area or you will get the bitter, white pith. 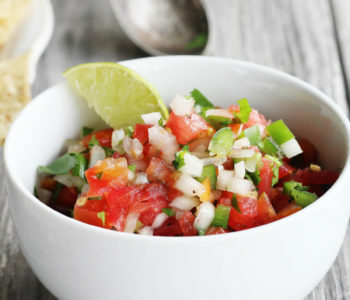 For this recipe, you only want the true zest with all of the aromatic and flavorful oils. 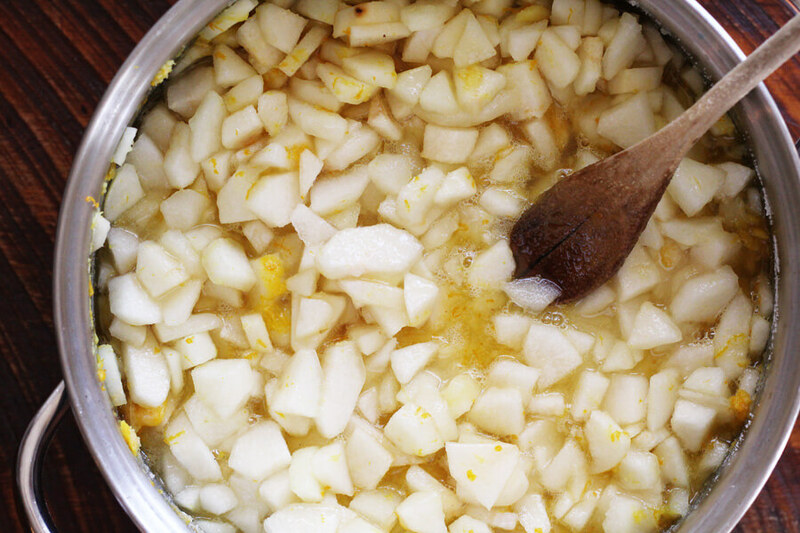 And yes, this recipe for Citrus + Ginger Pear Preserves calls for a lot of zest. That’s what really brings that punch of orange and lemon flavor to the preserves. 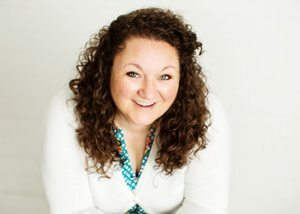 Let’s talk Ginger! I absolutely love the flavor that fresh ginger brings to my recipes. Most of the time I use it in my Asian-inspired recipes to give that zip of flavor that is unmistakably ginger. I have even used it in barbecue sauce. Love it. 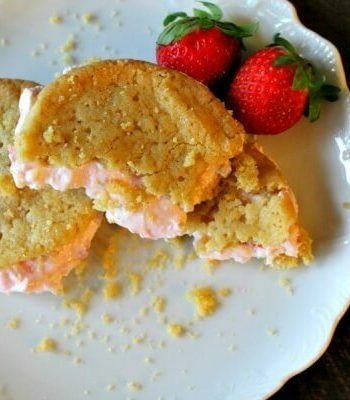 For this recipe, you must use ginger root, not ginger powder. 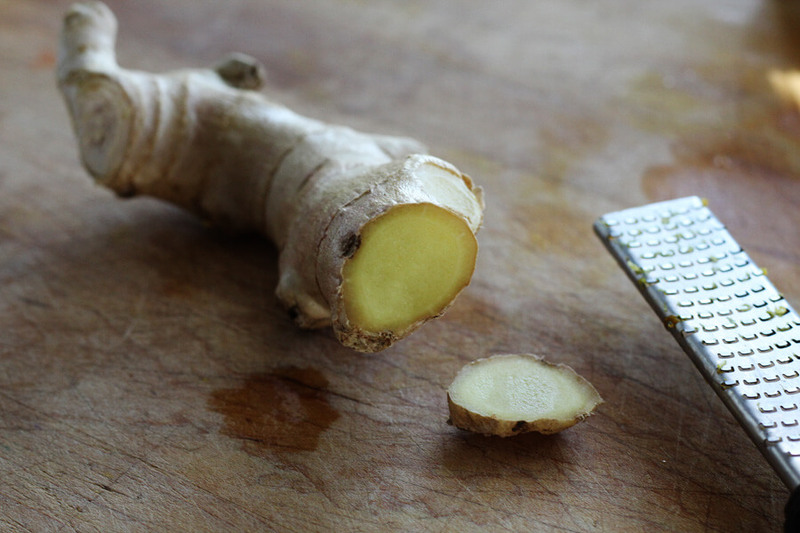 Find a 3 – 4 inch piece of ginger root in the produce section at your local grocery store. Peel the tough outer skin off, and finely grate the ginger. If you cannot find fresh ginger root, you can buy it pre-grated in little tubes. 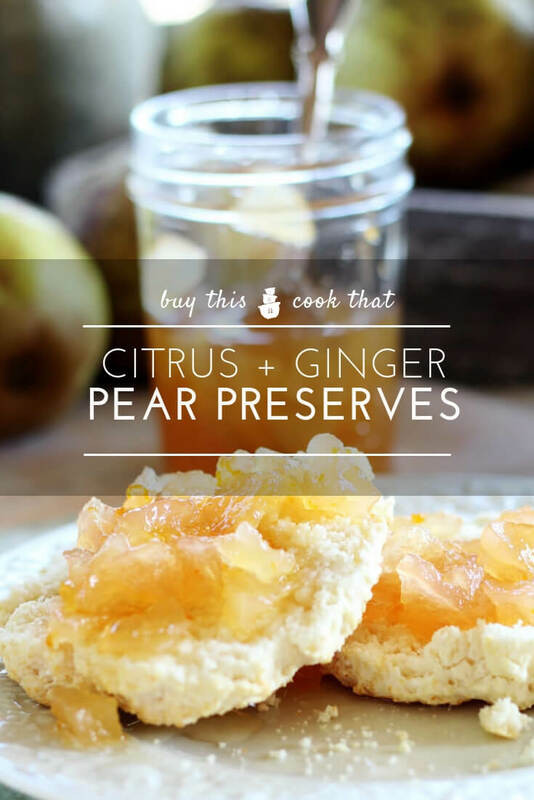 Fresh ginger gives the pear preserves a warm, spicy flavor that really sets this recipe apart from standard preserves. If you are a big ginger fan, use more. 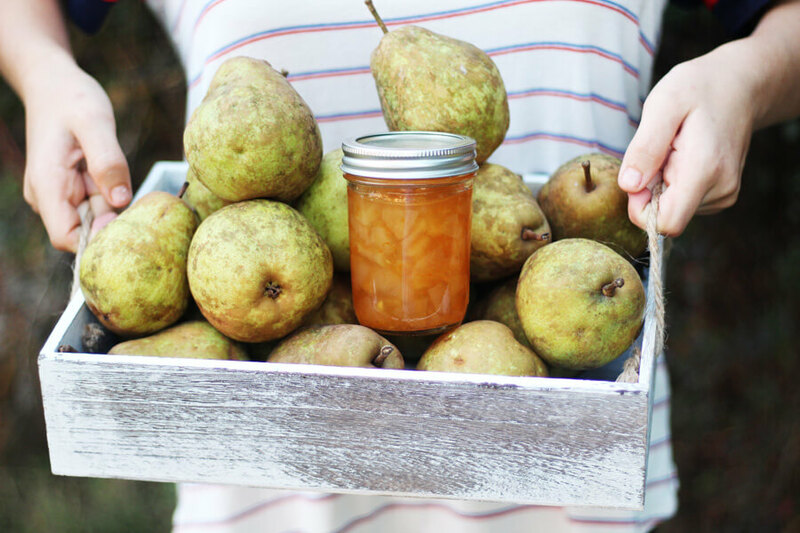 What kind of pears should I use for Pear Preserves? Any. Seriously, you can probably use any type of pear you would like to make preserves. Personally, I like to use nice, crisp pears so they retain their texture after cooking instead of turning to mush. 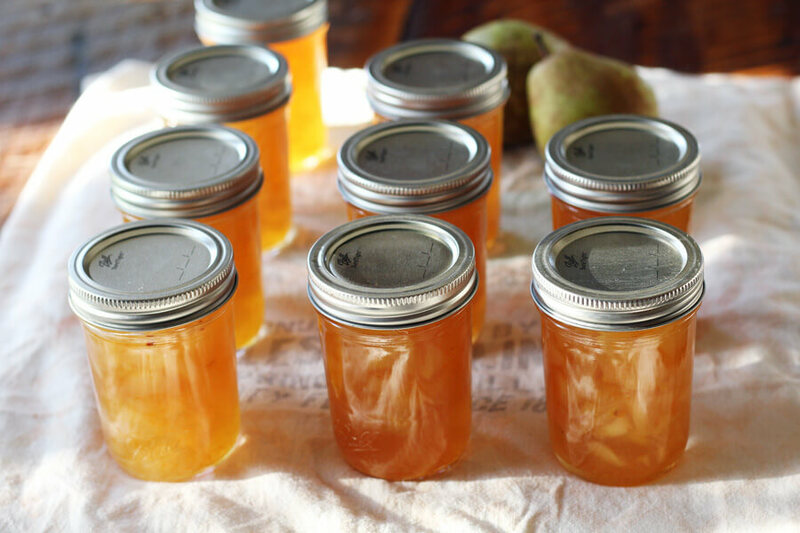 The key to this pectin-free preserves is to use the pears before they are fully ripe. Don’t wait for them to become soft. Pears and apples have the highest amount of natural pectin when they are under ripe. If your pears are ripe, you may want to consider using pectin according to the brand’s directions. Me? I’m winging it with super-crisp, possibly Seckel pears and my good buddy sugar. You can slice the pears, dice the pears, or give them a rough chop. I like having chunks of the fruit, so I cut mine in about 1/2 inch sized cubes. For even cooking, you want to get the pieces about the same size. If not, don’t sweat it. The Citrus + Ginger Pear Preserves will taste amazing. How long should I cook my pear preserves? Me? Once I added the juice, zest, fruit and sugar to the pot, I cooked the pear preserves for 25 minutes at a rolling boil. This, too, is flexible. 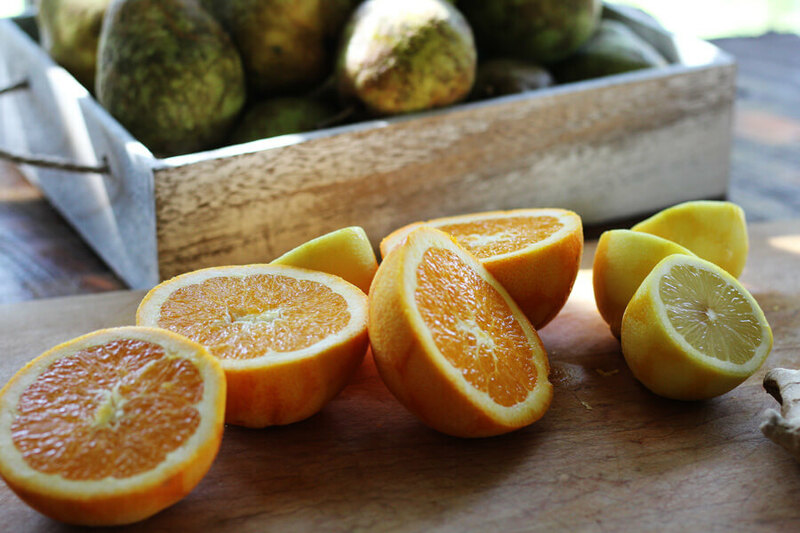 Fruit content – Since the moisture content in pears, oranges and lemons will vary, you may have to cook the preserves shorter or longer to get the thickness you are after. Me? I wasn’t looking for a “jelly” or “jam”, so I gave them a quick boil. Fruit texture – Due to differences in the texture of pears based on variety and ripeness, the cook time will vary. Fifteen minutes at a rapid boil is a great rule of thumb. You can add more time as needed. Gel stage – This is where making preserves gets a little scientific. You want the natural pectin in the fruit to work jelly magic with the sugar. 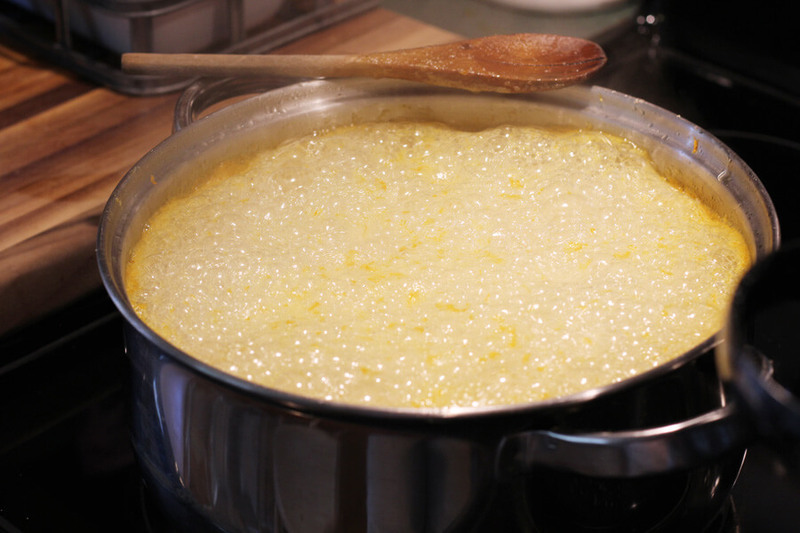 To do this, you want to boil the fruit and sugar mixture until it reaches a partial “gel stage”. Gel stage simply means that the preserves will “set up”. Again, throw in the “pectin” and ripeness variable. Me? I’m not losing any sleep at night over this part. I want a natural, simple, sweet preserves. I’m not making jelly, remember? If you are looking for that perfect gel stage, click here to learn more. TIP: Use a large stainless steel pot to cook pear preserves. Why? Large gives you plenty of room in case of boil overs. Stainless steel is recommended because we are cooking acidic ingredients. Stainless steel is a non-reactive material. If you use anything that is “reactive” the acid in the food will create a metallic taste to your end product. BOO! A word of caution: you are working with VERY HOT BOILING SUGAR. I recommend making preserves when the kids are asleep or gone, and your pot has your full, devoted attention. I like to cook my pear preserves until the fruit is tender and translucent but not mushy. This takes between 15 – 25 minutes. Once the mixture is cooked, the next step is to CAREFULLY ladle the hot sugary pears into the prepared hot jars. Using a large mouth funnel, carefully ladle the hot preserves with an even ratio of fruit to syrup content into hot, sterilized jars. Fill the jars, leaving 1/4 inch of head space at the top. Remove all air bubbles by slowly running a butter knife around the inside edge of the filled jars. Trapped air bubbles can prevent proper sealing. Using a clean, damp paper towel, wipe the jar rims clean. Center the prepared jar lids onto the jar. Screw the clean jar rings fingertip tight. Do not over tighten. Repeat until all jars are filled and lidded. This recipe will make about 10 half pints. With the water canner rack resting on top of the water canner, place the filled jars in the rack. Gently lower the canning rack into the hot water. The jars should be completely submerged and covered by 1 inch of water. Place the lid on the water canner and bring the water to a rolling boil. Process the pear preserves in the boiling water for 10 minutes. TIP: Processing time of 10 minutes starts when the water starts boiling. When the time is up, remove the canner from heat and let the jars sit in the hot water for 10 minutes. You want them to adjust to temperature slowly. Then transfer the jars to a towel-lined surface away from air drafts. This is to ensure that they cool down slowly and seal properly. Now…listen for the “pops”. You should hear a pop for every jar you made. That’s the fun part! Cool for 24 hours then check the seals by pressing down in the center. If the center of the lid flexes and makes a noise, then the jar did not seal. Just put any of those in the fridge and use within 3 weeks. But, if you followed the directions you should have a whole set of perfectly sealed pear preserves. Tighten the rings securely and store. 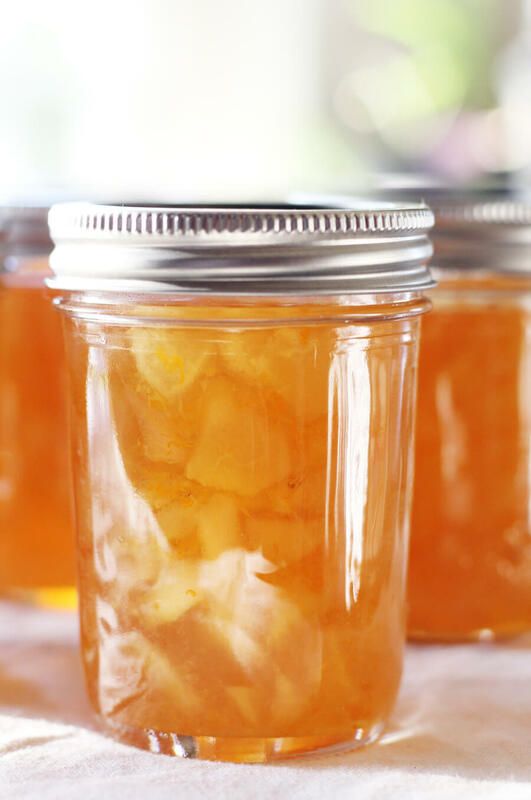 Citrus + Ginger Pear Preserves can be stored in a pantry at room temperature for many months. It is such a glorious feeling to open your pantry in the middle of the cold winter and find a jar of sunshine! Preserves also make a thoughtful gift for family and friends. So feel free to make a double batch. You can see the pear chunks preserved in the citrusy-ginger syrup. So good. 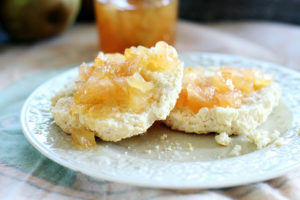 The first thing I did as soon as the pear preserves were ready is whip up a batch of hot, buttery biscuits, ya’ll. Confession: I ate a whole jar of these pear preserves by myself. Don’t judge me, it was a teeny-tiny little jar and I had a lot of biscuits to take care of. Does that count as a #SouthernGirlProblem? Use quality, firm pears. Cut away all the core and stem and any brown soft spots. Be creative. 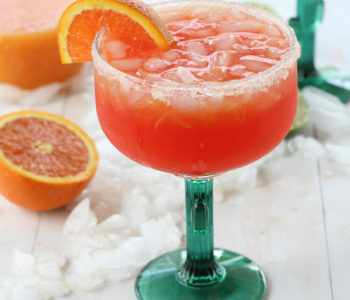 Try different types of citrus. Add some chopped cherries or pineapple. Make your own labels for a custom gift giving experience. Don’t skip the sanitizing step. Inspect your jars before canning. Toss any jars that have chips in the glass. Watch for hot sugar boil overs! Be careful. Use a large, stainless steel non-reactive pot to cook your preserves in. Wipe down the jar rims after filling to ensure a proper seal. Processing time in the water bath canner starts after the water boils. 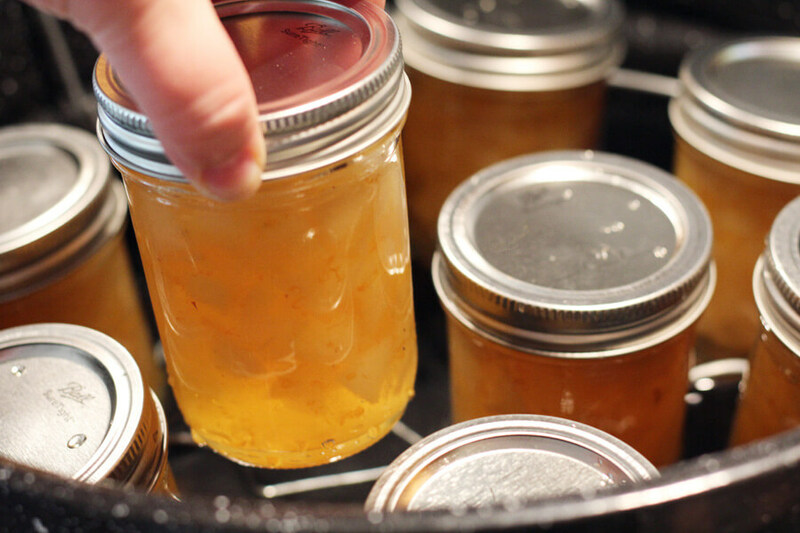 Cool down the jars slowly after canning to prevent cracked jars. Place the cooling jars on layers of towels away from any fans or air drafts. Cool for 24 hours before enjoying your preserves. This lets the preserves set up and ensures a good seal. Tighten the rings before storing. 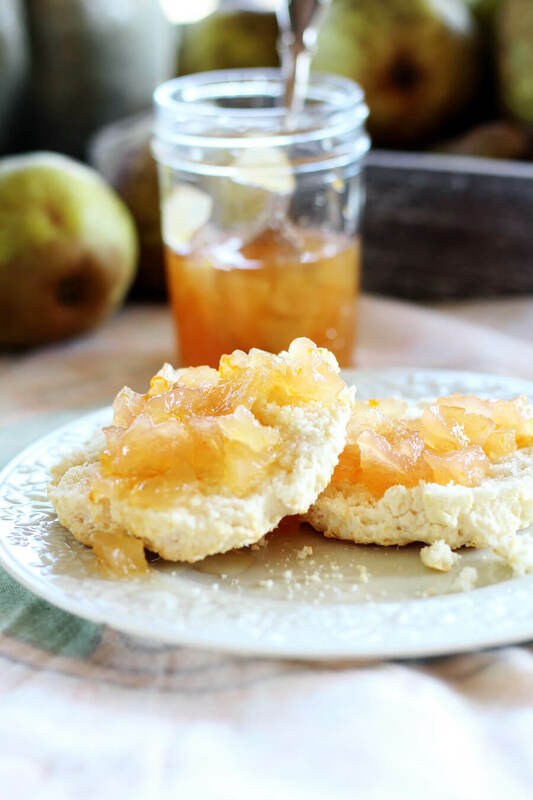 Deliciously sweet with juicy pears and flavored with fresh ginger, oranges and lemons, this recipe for pear preserves will grace your breakfast table with sunshine. Clean and sterilize jars, lids, and rings according to blog post instructions given above. Prepare a water bath canner according by filling 2/3 full of hot water and place on the stove to simmer. 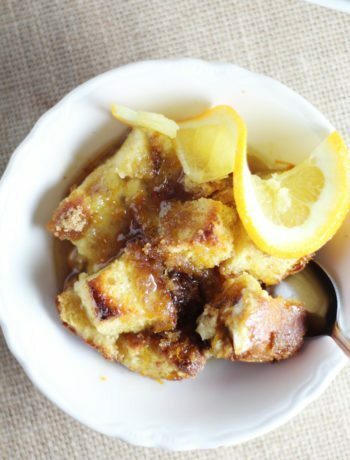 Combine the prepared pears, orange juice, orange zest, lemon juice, lemon zest, and sugar in a large stainless steel pot. Stir over medium heat until the sugar has dissolved and a syrup forms. Increase to a rolling boil. Cook for 15 - 25 minutes, stirring frequently. Lower heat slightly as needed to prevent boil overs. Cook until the pears are translucent. 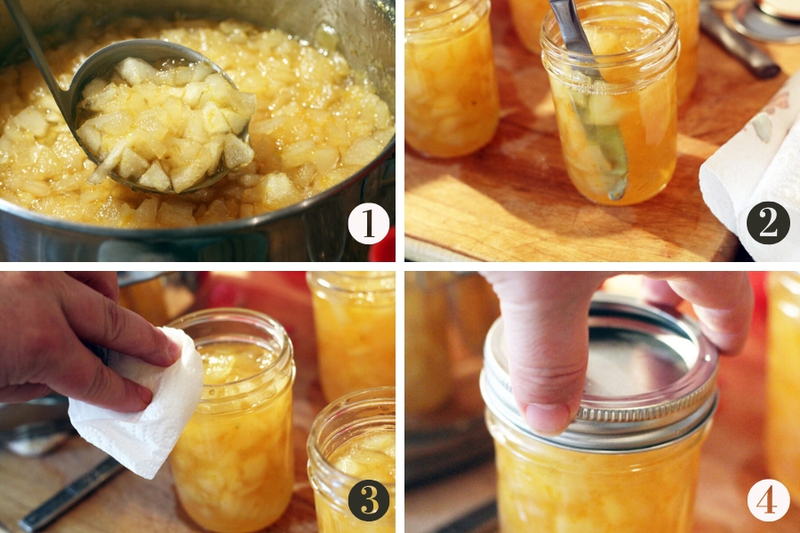 Carefully ladle the hot pear preserves into prepared jars leaving 1/4 inch of head space. Remove all air bubbles and wipe the rims. Center the lids on each jar. Screw rings on fingertip tight. Place the jars in the wire canning rack and gently lower into the water bath canner. Place the lid on the water bath canner. Bring the canner to a boil. Once the water is at a rolling boil, process the preserves for 10 minutes. Remove the canner from heat and let the jars rest in the canner for 10 minutes. Transfer the hot jars to a towel-lined surface away from air drafts. Cool for 24 hours. Check all seals. Tighten lids and store in the pantry for several months. 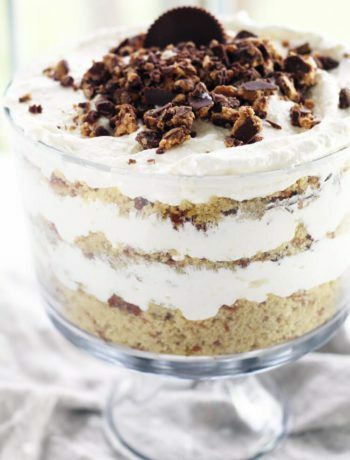 This recipe will make about 10 Half Pint Jars. Each half pint contains 16 tablespoons x 10 jars = 160 total servings. The nutritional value listed is per each 1 Tablespoon-sized serving. 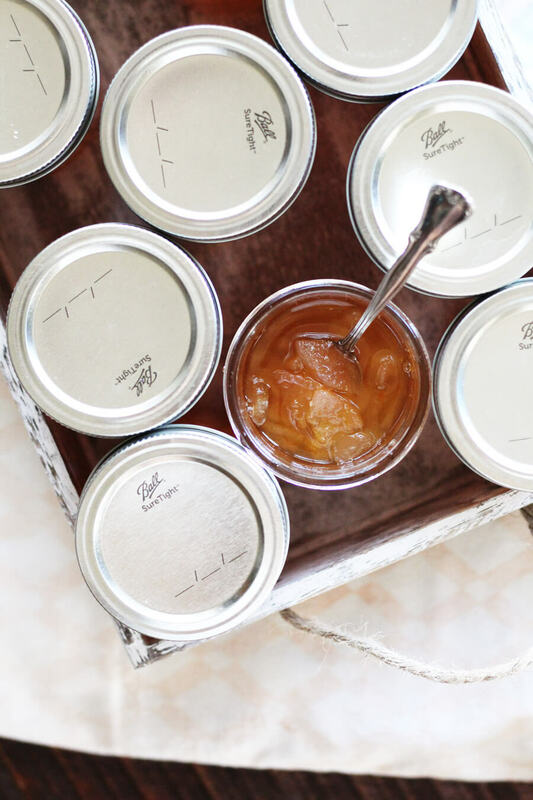 Please read the blog post for more detailed instructions on canning. Just the sound of Pear preserves makes me drool. I love the flavors in there. Love the pictures. Thank you so much! We had a lot of fun making this one. Such a yummy reward afterward, lol. Awww, my Mama had a pear tree in her yard too, so this really takes me back. She made pear preserves too, and a “pear crisp” just like an apple crisp, but with pears. Thanks for the trip down memory lane. I love that you added fresh ginger to the preserves. 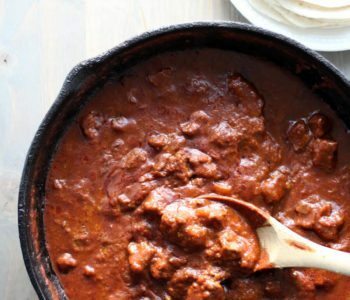 Such a perfect fall recipe. Can’t wait to give this a try! Thank you so much. I really wanted to add so much more because I LOVE ginger, but didn’t want to over do it. Hope you have a chance to try it out. 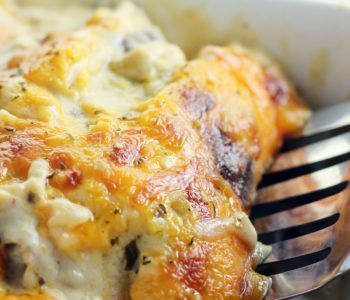 Not only does this sound amazingly delicious but your photos are stunning! Very inviting! Thank you so much! 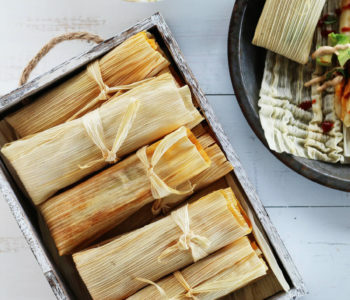 This was a fun recipe to shoot, and even better to eat. 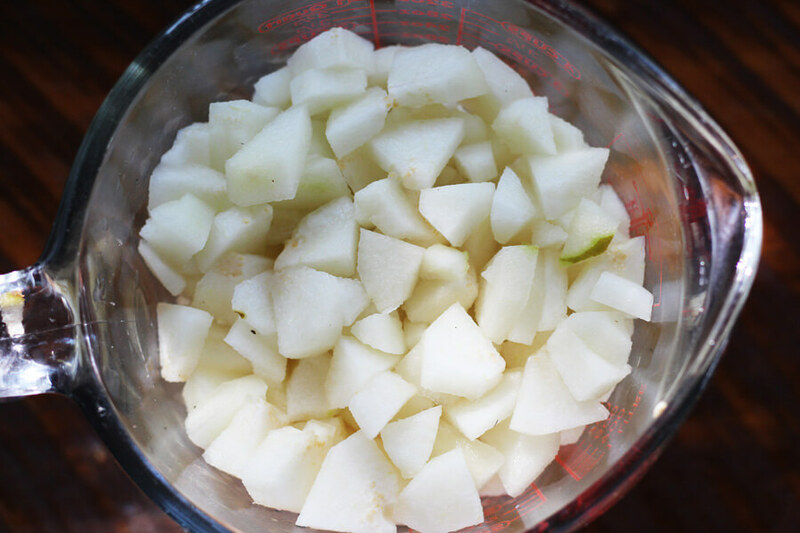 I love when I find a good pear recipe because you don’t come across many of them! Cannot wait to try it! Agreed, pears are very underrated in the fruit world.